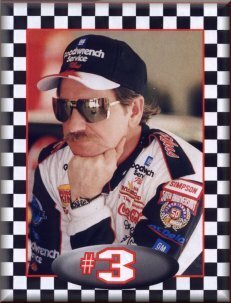 All who know me...know I live and breathe "Dale Earnhardt". Dale Earnhardt has been my hero for most of my life. He taught me how to fight, dig and claw my way back to the top, when I was down. He showed me this through his own actions. When people were getting me down, he taught me to stand tall and "Consider the source". And hold my head high. As a fan of Dale's, I was more eager to learn about the Racing Roots of Nascar and took the time to learn its history. Through his mischievious grin, and driving style, he taught me to appreciate life at its best. The only comfort I have right now, is that Dale didn't suffer and was doing the only thing he ever wanted to do in his life....Racing! After all these years, Dale's now reunited with his father and he's finally able to go fishing again with Neil Bonnett. There was never a greater friendship. Dale was part of our family. 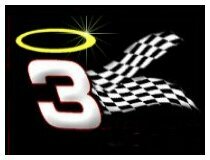 We shared our living room with him every Sunday and as far as we were concerned, in our eyes the sun rose and set on Dale Earnhardt each raceday. Our hearts go out to his wife and family. There will never be another driver like Dale Earnhardt. 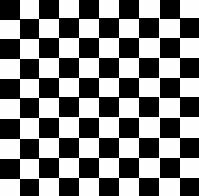 He was a legend and did more single handedly for the sport of Stock Car Racing then any other driver. Winston Cup will never be the same. In our home, the Earnhardt t-shirts will still be worn, but now with more reverance. My winter coat will have even more special meaning as I proudly display his signature on the sleeve. He will live on in our hearts forever as the true "Champion" he was.